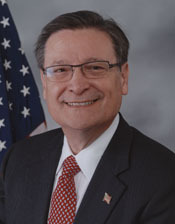 Elected to Congress during the 2010 midterm elections, Francisco Raul “Quico” Canseco sought to minimize the presence of the federal government in his constituents’ lives. He promoted economic development via balancing the budget, supporting small businesses, and touting tax cuts. Canseco also wanted to strengthen enforcement along the U.S.-Mexico border that stretched along much of his district. However, a challenge to the reconfigured district that enabled Canseco to win his seat in 2010 hampered his ability to return to the House for a second term in 2012. After entering Congress, Canseco pursued an agenda that appealed to his conservative supporters. One of his bills was an amendment to the Dodd–Frank Wall Street Reform and Consumer Protection Act to repeal a provision in the original law that established a financial research office (H.R. 3044). He also sponsored a bill to terminate the Hope VI Program, which provided assistance to public housing agencies for demolition, replacement housing, and site revitalization (H.R. 3539). 1Almanac of American Politics, 2012 (Chicago, IL: University of Chicago Press, 2011): 1591; Politics in America, 2010 (Washington, D.C.: CQ Press, 2011): 962. 2“Francisco Canseco’s Biography,” Project Vote Smart, http://votesmart.org (accessed 19 December 2016); “FMC Developers, Inc.,” Texas Corporates-Company Profiles of Texas, http://www.texascorporates.com (accessed 19 December 2016). 3Almanac of American Politics, 2012: 1591; Politics in America, 2010: 962; Texas Senate, Resolution No. 417 (Enrolled Version), “In Memory of Consuelo Sada Canseco,” 75th Legislature, Regular Session, ftp://ftp.legis.state.tx.us/bills/75R/billtext/html/senate_resolutions/SR00400_SR00499/SR00417F.HTM (accessed 14 December 2016); Chris Cilizza, “Texas; Attorney Self-Funding A Bid for Bonilla’s Seat,” 10 May 2005, Roll Call: n.p. ; David M. Drucker, “Republican is Quico On the Draw Building His Consultant Team,” 14 June 2007, Roll Call: n.p. ; Greg Jefferson, “Republican Jumps Headfirst into the Race for District 23,” 21 July 2007, San Antonio (TX) Express-News: 4B; Tracy Idell Hamilton, “Larson, Canseco Tangle in GOP Race for House,” 1 February 2008, San Antonio Express-News: 1B; Guillermo X. Garcia, “Eight Trying to Dislodge Rep. Rodriguez in Huge District,” 17 January 2010, San Antonio Express-News: 1B; Texas Office of the Secretary of State, “2004 Republican Primary Election-Race Summary Report,” http://elections.sos.state.tx.us/elchist105_state.htm (accessed 19 December 2016); Texas Office of the Secretary of State, “2004 Republican Party Primary Runoff Election-Race Summary Report,” http://elections.sos.state.tx.us/elchist112_state.htm (accessed 1 November 2016); Texas Office of the Secretary of State, “2008 Republican Party Primary Election-Race Summary Report,” http://elections/sos.state.tx.us/elchist135_state.htm (accessed 1 November 2016). 4Almanac of American Politics, 2012: 1591; O. Richard Pimentel, "Only in Austin Does This Make Sense," 11 January 2012, San Antonio Express-News: 1B. 5Garcia,“Eight Trying to Dislodge Rep. Rodriguez in Huge District”; Gary Martin, “Hurd, Canseco Lay Groundwork for Fall Battle,” 13 March 2010, San Antonio Express-News: 9B; Gilbert Garcia, “Canseco Defeats Hurd,” 14 April 2010, San Antonio Express-News: 1B; Politics in America, 2010: 962. 6Gilbert Garcia, “Candidate Has Faced $715,000 in Liens,” 8 July 2010, San Antonio Express-News: 1A; “Ticket Led to Arrest Warrant for House Candidate,” 30 July 2010, Associated Press; Gilbert Garcia, “Canseco’s Claim about Rodriguez Was Wrong,” 19 September 2010, San Antonio Express-News: 7B; James C. McKinley, Jr., “In House Race in Texas, a Spotlight on the Hispanic Vote,” 29 October 2010, New York Times: 18; “Election Statistics, 1920 to Present,” http://history.house.gov/Institution/Election-Statistics/Election-Statistics. 7Kate Zernike, “Tea Party Set to Win Enough Races for Wide Influence,” 14 October 2010, New York Times; Linda Feldmann, “After GOP Landslide of Election 2010, What Next for Obama?” 3 November 2010, Christian Science Monitor, http://www.csmonitor.com/USA/Elections/2010/1103/After-GOP-landslide-of-Election-2010-what-next-for-Obama; Todd J. Gilman, “Freshmen Head to D.C. Full of Ambition,” 11 November 2010, Dallas Morning News: A01; Vanessa Williamson, Theda Skocpol, John Coggin, “The Tea Party and the Remaking of Republican Conservatism,” Perspective on Politics 9, No. 1 (March 2011): 25–43, esp. 26–27. 8“Rep. Francisco Canseco to Deliver Republican Address to the Nation in Spanish,” 23 January 2012, States News Service. 9H.R. 3044, To amend the Dodd–Frank Wall Street Reform and Consumer Protection Act to Repeal the Office of Financial Research, https://www.congress.gov (accessed 2 December 2016); H.R. 3539, Hope VI Program Termination Act of 2011, https://www.congress.gov (accessed 2 December 2016); H.R. 2124, Southwest Cross-border Violence Recognition Act of 2011, https://www.congress.gov (accessed 2 December 2016); H.R. 6368, Border Security Information Improvement Act of 2012, https://www.congress.gov (accessed 2 December 2016); Congressional Record, House, 2nd sess. (19 September 2012): H6119. For some of the local reactions to these bills within Canseco’s district, see Gary Martin, “Democrats Target Canseco over Medicare,” 20 April 2011, San Antonio Express-News: 5B; Joni Simon, “Congressman Presents Republican Plan at Town Hall,” 5 May 2011, San Antonio Express-News: 3NW. Canseco is quoted in Martin, “Canseco Seeks Definition of ‘Cross-Border’Violence,”8 June 2011, San Antonio Express-News: 6A. 10Scott Stroud, “Key Figures Passing on Canseco,” 17 July 2011, San Antonio Express-News: 1B; Richard Dunham and Nolan Hicks, “Court’s Maps Could Be Route to Dem Successes,” 30 November 2011, San Antonio Express-News: 1A; Gary Martin, “Redistricting; Trial Cuts to Heart of the Challenge,” 19 January 2012, San Antonio Express-News: 1B; Nolan Hicks, “Redistricting; Area Districts at Heart of Decision,” 29 August 2012, San Antonio Express-News: A11. 11“Election Statistics, 1920 to Present,” http://history.house.gov/Institution/Election-Statistics/Election-Statistics/; Victoria Pelham, “Gallego, Canseco Bash Away in W. Texas Fight,” 3 August 2012, Dallas Morning News: A05; Molly Hennessy-Fiske, “Candidates Contend for Voters in Spanish,” 23 September 2012, Los Angeles Times: A12; Jay Root, “Race Tightens in Divided District,” 21 October 2012, New York Times: 31A; Gary Martin, “District 23 Race; Canseco Concedes to Gallego after Voter Fraud Claim,” 10 November 2012, San Antonio Express-News: A11; Canseco quote from Todd J. Gilman, “After Three Bids for Congress, Tea Partier Francisco ‘Quico’ Canseco is Out after One Term,” 9 December 2012, Dallas Morning News: n.p. 12Gilbert Garcia, “Puro San Antonio; Canseco Launches His Comeback Campaign,” 9 August 2013, San Antonio Express-News: A2; Emily Wilkins, “Quico Canseco Will Try to Reclaim Seat from Rep. Pete Gallego,” 10 December 2013, Dallas Morning News: n.p. ; Sean Sullivan, “Former Rep. Canseco Faces GOP Runoff against Hurd,” 5 March 2014, Washington Post: https://www.washingtonpost.com/news/post-politics/wp/2014/03/05/former-rep-canseco-faces-gop-runoff-against-hurd/?utm_term=.c852ee70adcf; John W. Gonzalez, “Canseco, Hurd Hit the Road for Votes,” 22 April 2014, San Antonio Express-News: A5; Texas Office of the Secretary of States, “2014 Republican Party Primary Election,” http://elections.sos.state.tx.us/elchist169_htm; Texas Office of the Secretary of State, “2014 Republican Party Primary Runoff Election-Race Summary Report,” http://elections.sos.state.tx.us/elchist112_state.htm (accessed 1 November 2016) ; Jose DelReal, “Will Hurd wins TX-23 rematch against Francisco ‘Quico’ Canseco,” 27 May 2014, Politico: http://www.politico.com/story/2014/05/will-hurd-texas-francisco-quico-canseco-107142. "Francisco (Quico) Canseco" in Hispanic Americans in Congress, 1822-2012. Prepared under the direction of the Committee on House Administration by the Office of the Historian and the Office of the Clerk, U.S. House of Representatives. Washington: Government Printing Office, 2013.